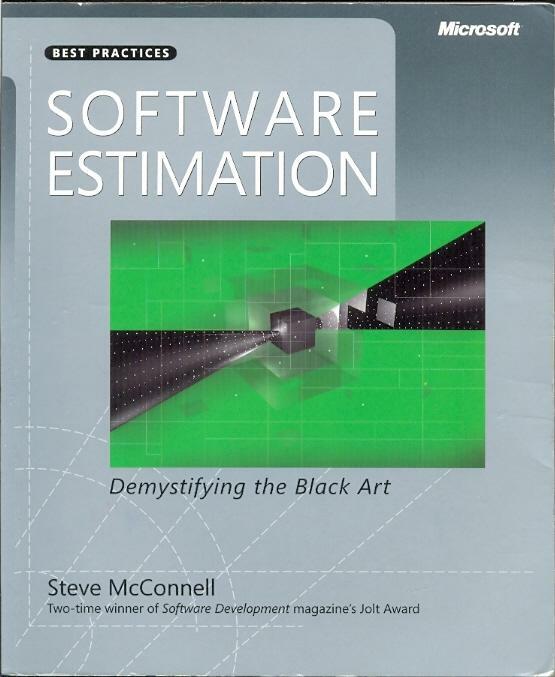 This review covers Software Estimation by Steve McConnell (Microsoft Press, 2006). [T]he typical software organization is not struggling to improve its estimates from ±10% to ±5% accuracy. They typical software organization is struggling to avoid estimates that are incorrect by 100% or more (p. xv). I wrote this book for developers, leads, testers, and managers who need to create estimates occasionally as one of their many job responsibilities. I believe that most practitioners want to improve the accuracy of their estimates but don’t have the time to obtain a Ph.D. in software estimation…If you are in this category, this book was written for you (p. xvi). Chapter 1, “What is an Estimate?”: You can get into some confusing situations when some of you are talking about an effort estimate and others are talking about a plan to hit a target. This chapter explains the difference between estimates, targets, and commitments. Chapter 2, “How Good an Estimator Are You?” presents a quiz that helped me see that “90% confident” wasn’t what I thought it was! Chapter 3, “The Value of Accurate Estimates”, goes to some length to demonstrate the value of knowing the size of the project you’re embarking on, and the great cost to an organization that thinks a project will be significantly smaller than it turns out to be. When telephone numbers are entered, will the customer want a Telephone Number Checker to check whether the numbers are valid? This chapter also introduces the concept of the Cone of Uncertainty, where the maximum precision of an estimate is impaired by not knowing what the project consists of. To get to a more accurate picture of how big the project is, you have to narrow that uncertainty. McConnell explains, “The Cone of Uncertainty doesn’t narrow itself. You narrow the Cone by making decisions that remove sources of variability from the project” (p. 39). Chapter 5, “Estimate Influences”, introduces the concept of diseconomy of scale and discusses personnel and other factors that influence the amount of effort that will be required to complete a project. Chapter 7, “Count, Compute Judge”, introduces the concept that counting yields more accurate results than computing a number and computing yields more accurate results than expert judgment. This theme comes up again other places later in the book. Chapter 8, “Calibration and Historical Data”, introduces the importance of collecting historical data on your projects and gives details, guidance on what data to collect, and pitfalls to avoid. Historical data is another theme that comes up many times throughout the rest of the book. Chapter 10 covers another quick and helpful technique — Decomposition (and its brother, Recomposition); Chapter 15, “Use of Multiple Approaches”, gives an example of using a combination of decomposition and expert judgment (p. 166) — a combination I have found helpful in my own estimating. Chapters 18 through 20 cover special issues in estimating size, effort, and schedule, respectively. Chapter 21 (p. 245) introduces a way of dealing with schedule risks (things that could come up and delay the project) by weighting them by the amount of time they would delay the schedule, times their probability of occurring, yielding a “Risk Exposure” (so for example a two-week potential delay that is 25% likely would have a 0.5-week Risk Exposure. Using this concept you can figure what kind of contingency buffer your project is probably going to need. Chapter 21, “Estimate Presentation Styles”, has several helpful ideas in it, such as an estimate with risk quantification, for example “+1 month if the graphics-formatting subsystem is delivered later than planned” (p.252), and “Don’t try to express a commitment as a range” (p.257). Chapter 23 is gold. McConnell talks here about people stuff — why negotiations between technical staff and executives tend to be difficult for technical staff to navigate. “Estimate negotiations tend to be between introverted technical staff and seasoned professional negotiators” (p. 259). McConnell then gives some help on how to engage in win-win negotiation with executives: keeping the best interests of the company in mind, positive assertiveness, taking schedule requirements seriously, and maintaining the courage to tell the truth. You hold the key to a vault of technical knowledge, and that puts the responsibility for generating creative solutions more on your shoulders than on anyone else’s. It’s your role to propose the full range of possibilities and tradeoffs (p. 266). Avoid saying, “No, I can’t do that”; instead, redirect the discussion toward what you can do. The more options you generate that support doing what’s best for the organization, the easier it will be to show that you’re on the same side of the table as the person you’re problem solving with (p.268). The purpose of the schedule estimates in this chapter is not to predict your final schedule to the day but to provide a sanity check on your schedule-related plans. Once you’ve used schedule estimation to ensure that your plans are reasonable, detailed planning considerations (such as who is available when) will take precedence over the initial schedule estimation described (pp. 230-231). Recognize that these allocations of effort to phases are approximate. They represent useful starting points for planning. Once the estimates get you into the right planning ballpark, detailed planning considerations should take precedence over these initial estimates (p. 237). The book covers both iterative and sequential project styles. As I read in the first few chapters about the dangers of corporate wishful thinking regarding estimation and scheduling and began to dig into the smorgasbord of techniques that are available to get a picture of the size of a project, my pride began to swell and my attitude began to sour. Chapter 23, “Politics, Negotiation, and Problem Solving”, was like an unexpected bucket of cold water on the head that snapped me out of my arrogant stupor and really helped to put the lessons of the book into proper perspective. My recommendation: don’t skip this chapter! It’s small (270 pages of main text) and a quick read that makes a wealth of study accessible — McConnell pulls from many sources to give organizations the tools they need to get a lot better at project planning, without having to take a lot of time to get up to speed on what he calls the “science of estimation”. Well worth the small investment of time and money. This entry was posted in Book Reviews, People Stuff and tagged Estimation by danielmeyer. Bookmark the permalink.